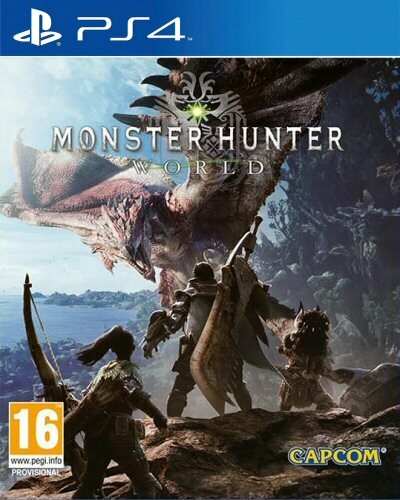 Buy Monster Hunter: World for PS4 in India at the best price. Screenshots, videos, reviews available. The Entertainment Software Rating Board (ESRB) ratings are designed to provide consumers with concise, impartial guidance about the age-appropriateness and content of computer and video games. The product that you are viewing is suitable for ages 13 and older. May contain violence, crude humor, minimal blood, simulated gambling, strong language. Monster Hunter: World sees players gear up to venture on quests to battle against fearsome monsters, progressively improving their hunting abilities as they play. Loot collected from fallen foes can be used to create new equipment and armor upgrades as players seamlessly move across map areas that comprise the living ecosystems. The landscape and its diverse inhabitants play a critical role as players strategically use the surrounding environment to their advantage. Hunters must use their cunning and skill to survive the intense and evolving fights as they battle to become the ultimate hunter! Welcome to the new World: Taking on the role of a hunter, players are tasked with going on a research expedition to a newly discovered continent known only as "new world" as they venture on quests to discover more about this mysterious land. Master the beasts: A variety of ferocious creatures inhabit the new world landscape including the series mainstay Rathalos and the all new Anjanath. Players can mount the monsters with the dynamic riding mechanic, allowing them to travel along the monster's body and deliver locational damage.